Any device, any OS, any file! We restore data from all devicesor there is NO charge. we successfully restore them all! No Data - No Charge - No Risk! Free shipping to our lab. Is your data no longer accessible? Have you dropped or damaged your hard disk drive? Is it making strange clicking, beeping, or grinding noises? Has your RAID Array got corrupted? The computer simply won't turn on? Your memory card or USB flash drive is not being recognized? Your phone is not functioning? Whatever the circumstances of your data loss may be, our specialists have seen it all and have the expertise and years of hands-on experience to successfully recover data from any failure, no matter how dire it may seem. Advanced data recovery and digital forensics are all we do! Contact ReStoring Data Canada today! Whether your hard drive experienced a physical or logical hard drive data loss, we can get you back up and running. We recover data from drives with read/write head, platter damage, firmware corruption, bad sectors, seized spindle motor, PCB failures, and file system corruption. Using proprietary tools, we can recover your data from virtually any failed flash media such as memory cards and USB sticks, including monolithic ones. 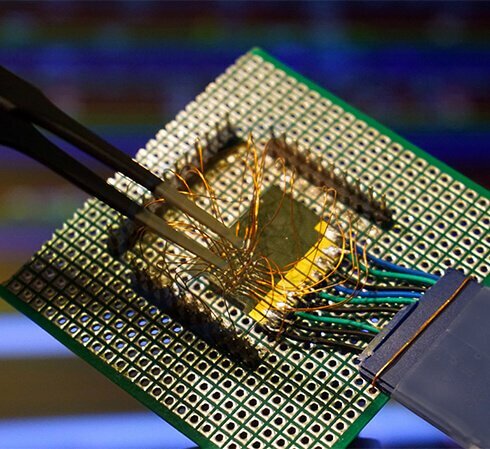 Our recoveries often include chip-off procedures and go as far as reverse engineering when necessary. We specialize in recovering data from any RAID systems regardless of size, interface, configuration (RAID 0, RAID 5, RAID 6, RAID 10, etc.) or file system. This includes recoveries from various proprietary RAID systems, such as NAS, Drobo, QNAP, and others. Our one-of-a-kind proprietary tool virtualizes the Drobo's BeyondRAID technology, which lets us rebuild the Drobo by working directly on the hard drives. This allows us to offer you the highest Drobo recovery success rate in the industry! We can recover your invaluable photos and videos, contacts, or SMS text messages. Our lab is fully equipped to make highly complex repairs, including from water damage. 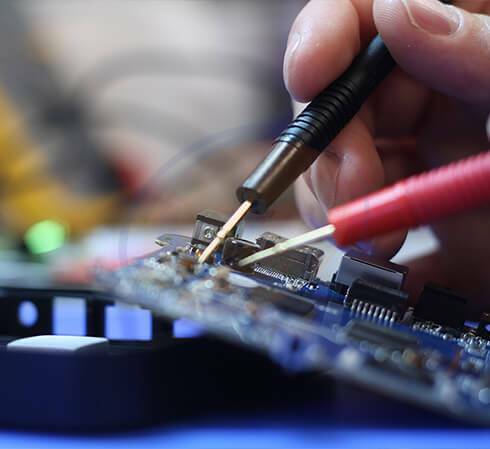 These procedures often involve deep electronic cleaning, micro-soldering, and chip-off data extractions. Our industry-renowned data recovery expertise allows us to comprehensively analyze any digital device and track down the information you need. Whether you are an individual or representing a corporation, we will tailor our digital forensics service to meet your needs. Straight forward pricing is set through our no-obligation, free evaluation. This provides you with a comprehensive assessment of the failure alongside a firm quote and a timeframe to restore your data. Our attentive and knowledgeable case managers provide professional, and accessible customer service throughout the entire data recovery process, assuring your needs are always met with urgency and sensitivity. Upon completing your recovery, a file list will be generated and emailed to you, so you can rest assured that every crucial file has been recovered. You only pay for a successful recovery of your data! All successful data recovery services include a one month complimentary warranty of your recovered data. This is to ensure that if you have lost your data for any reason within 1 month of the recovery we have you covered. To provide fair pricing and an accurate diagnosis, we must have your failed media in-hand. To facilitate this, we offer free shipping for all non-local clients whose media has not been previously tampered with (i.e. seals have been broken). Depending on your urgency, we offer 3 service type options (Economy, Priority and Super Rush) with the fastest option returning your data to you in as little as 24 hours. We will work past regular business hours and operate around the clock to complete a rapid and thorough recovery of your data. We are proud to have won British Columbia's Best Company Award for 2013 by Small Business BC, the People’s Pick Award in 2015 by the BBB, and most recently the 2016 Consumer Choice Awards in the category of Computer Data Recovery and Forensics. During those years, we were also a finalist at the BBB Marketplace Excellence Awards for performance, integrity, and trust. As the nature of our business involves dealing with private data, we commit to the absolute non-disclosure of any information or data supplied with, stored on, or recovered from your media. Your data will not be dealt with by any third parties and will be destroyed following one month of completion of work (unless instructed otherwise). 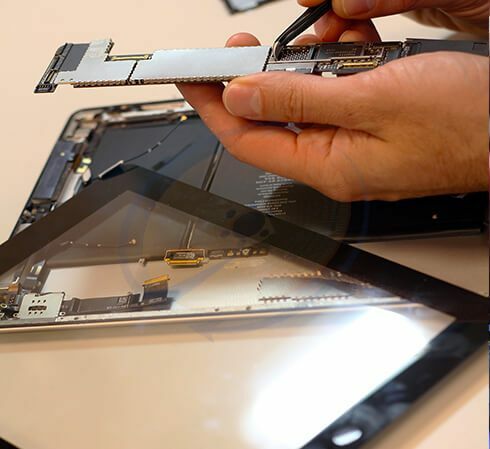 All physical data recovery services requiring internal work are performed in a Class-100 dust-free environment to avoid the potential for any detrimental contamination of the platters. Our consistent and intensive research and development produces leading data recovery proprietary tools that allows us to maintain a high success rate and often to recover data where others have failed. 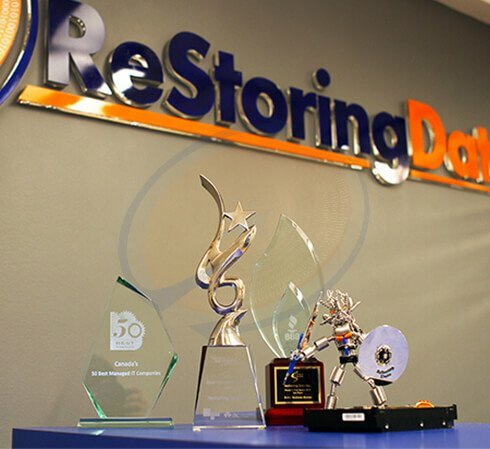 At ReStoring Data, we're passionate about providing our customers with the best data recovery experience possible. 1. Submit your failed media to any of our nationwide locations. 2. Quickly receive your no-obligation/free evaluation, which describes in detail the exact cause of your data loss, the necessary procedures for recovery, a timeframe to complete your case, and a firm quote. 3. You will receive a list of all of your recovered files. With our No Data - No Charge policy, you only pay when we successfully recover the data you need (100% performance based). 4. Your data is transferred to a new device and shipped back to your home or business! © Copyright 2018 - ReStoring Data Inc.